The 28-day detox is a longer program, but results in more changes for participants (because it’s longer, plus in 28 days you’ll create some pretty amazing habits). 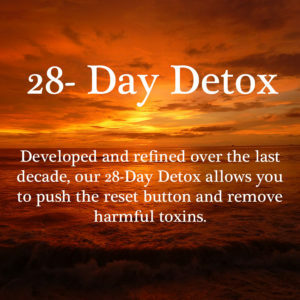 The 28-day detox is a tune up. It brings down inflammation as well but also digs a bit deeper and supports the liver, kidneys, and digestive tract to help metabolize daily toxins. Many of our most common complaints are due to inflammation and toxicity. This program can help increase your energy, improve your sleep, settle digestion, cut down on headaches, and lose some fat. It is estimated that your body comes into contact with over 800 toxins a day. 800! Without any intervention, this can quickly lead to illness. Take the necessary steps to offset this burden.